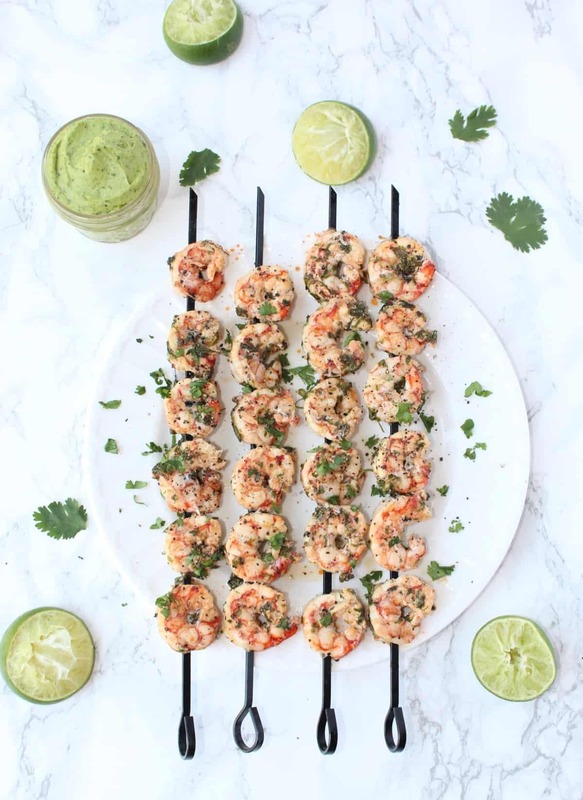 Fire up your grill and make this Cilantro Pepper Shrimp with Avocado Lime Dipping Sauce. 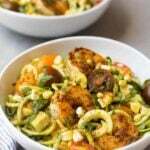 An easy, flavorful, and healthy dish perfect for grilling season! Grilling and summer go hand in hand. The days are longer and the nights are warmer. Grilling just makes sense. Especially with a cold beverage in hand. It seems like food just tastes better when it is made on the grill. We have a charcoal grill and you can taste the smokiness and flavor the charcoal gives the food. It is hard to describe, but seafood, veggies, and meat just tastes better on the grill. I made this shrimp two weekends ago for a Whole30 party with some friends and they were a success. And yes, when you do the Whole30 with a bunch of friends, you have potluck dinners on Saturday night and drink “mocktails”. Oh how the times have changed over the past few years. 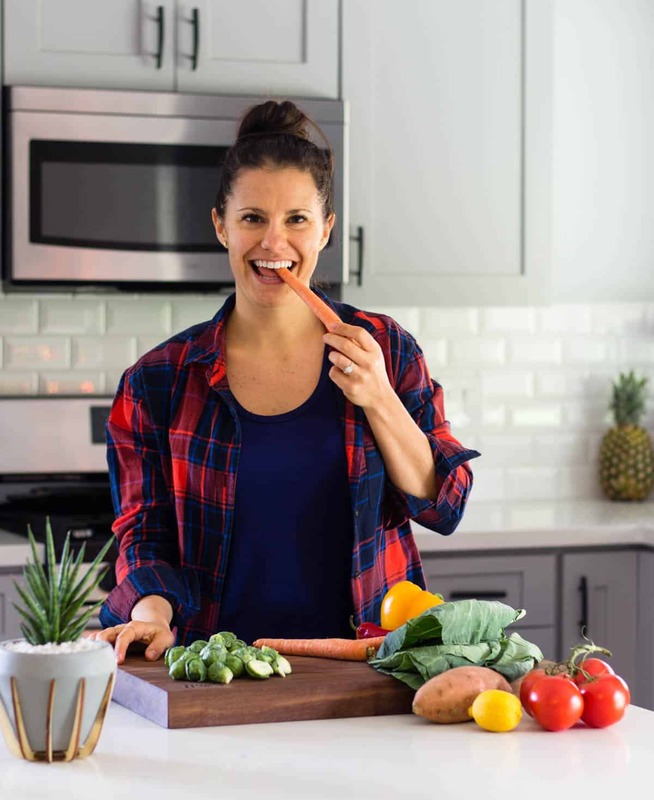 Five years ago I would of never thought I would get so much enjoyment out of being in the kitchen and making healthy recipes. Back to the shrimp. 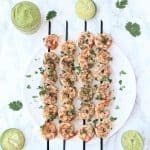 These cilantro pepper shrimp are super easy to make and if you don’t have a grill you don’t need one! I made these on a grill pan one time and they turned out perfectly. That’s what happens when the bf isn’t home and you don’t know how to grill by yourself. 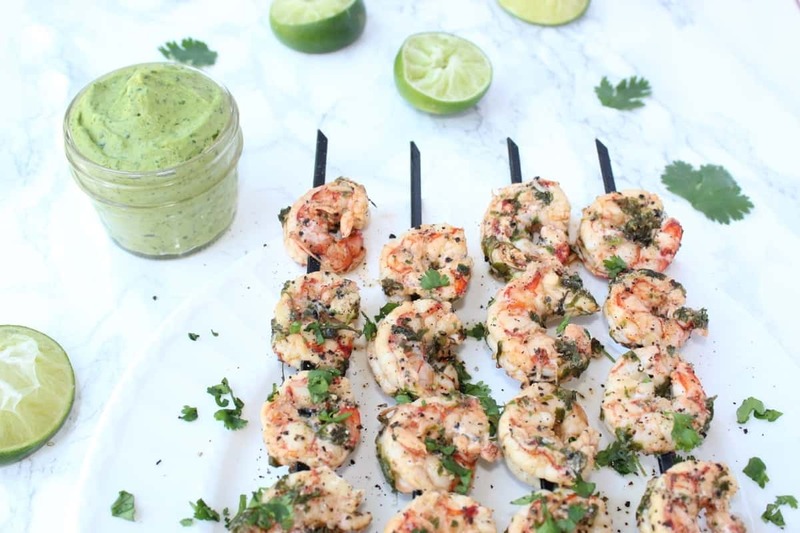 The shrimp get all their flavor from a cilantro pepper marinade. 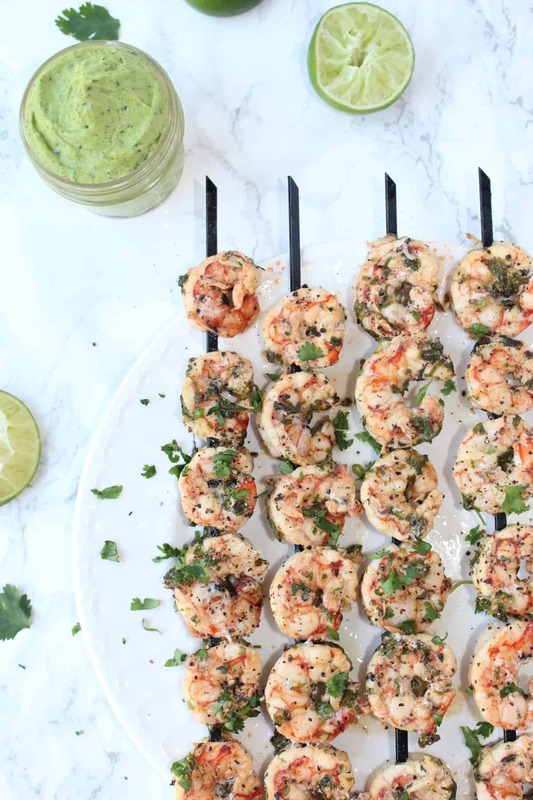 You skewer them up, and then grill. And when I say pepper, I mean pepper. It adds a nice kick to the shrimp. 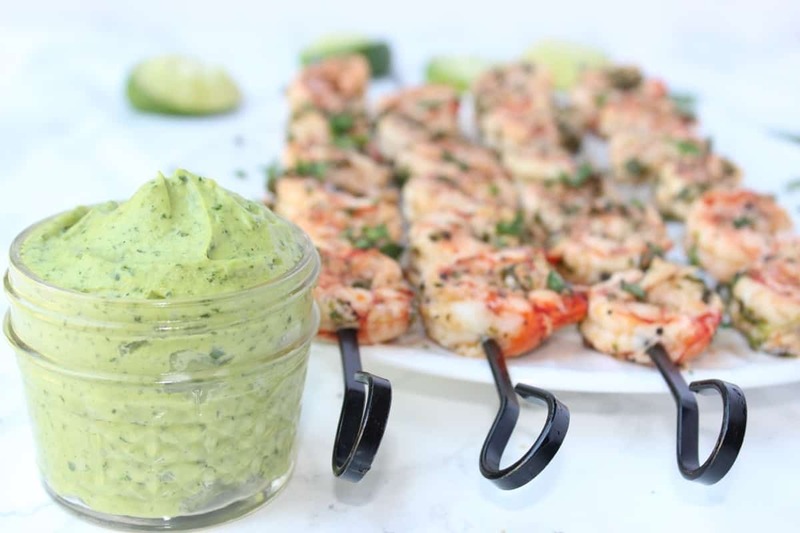 I added an avocado sauce for dipping because everyone loves dips. Just throw the ingredients in your blender and you have a creamy sauce in under a minute. 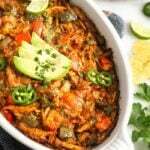 I literally ate half of this recipe in one day it is so good! I had to cut myself off to save some for lunch the next day. And maybe some for Michael too. If you don’t eat your food fast around this house, it won’t last! Combine the oil olive, cilantro, pepper, lime juice, and salt to large cup and blend with an immersion blender until cilantro is broken down. You can also do this in a blender. 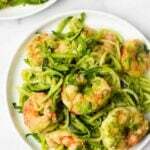 Place marinade in a large bag or container with shrimp and refrigerate for a minimum of 30 minutes, maximum of 3 hours. 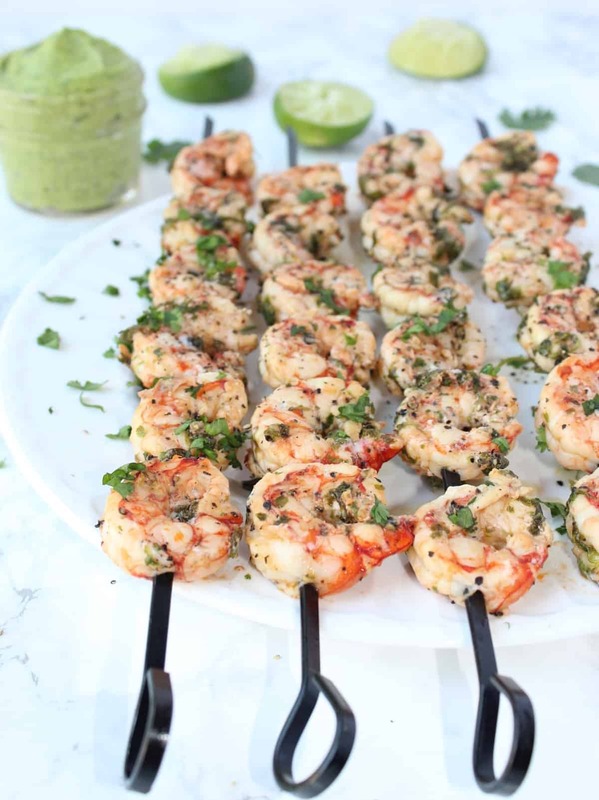 Using 4 metal skewers, pierce the shrimp so that you have an even amount of pieces on each. Heat either a grill or grill pan over medium-high heat. Once at temperature, add the skewers and cook for 3-4 minutes per side, or until they are firm. While the shrimp cooks, make the sauce. Add the ingredients to a blender and blend until smooth and creamy, about 1 minute. Top shrimp with more chopped cilantro and fresh black pepper. Enjoy! Are you excited for grill season? What is your favorite thing to grill? That dipping sauce and the shrimp looks REALLY good! 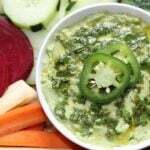 The avocado dip looks super creamy!